The Small Cap Equity market continued its advance in the third quarter, rising 3.6% on a total return basis, before seeing slight declines in September and increased volatility in the first weeks of October. The bigger story, of course, is what happened after quarter end, but that will just give us more to talk about next quarter. The strong outperformance of small caps relative to large caps this year evened out by the end of September, with the Russell 2000 Index ending only slightly ahead of the S&P 500 on a year-to-date basis: +11.5% compared to +10.6%*. 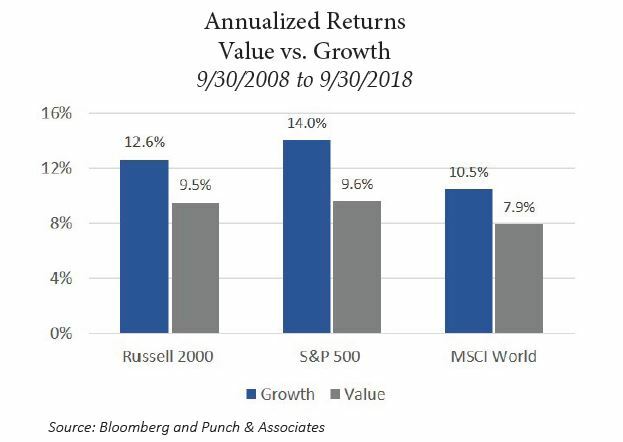 Amazingly, growth stocks continue their wide lead over value stocks, and in the third quarter the Russell 2000 Growth Index bested the Russell 2000 Value Index by a factor of more than 3-to-1: +5.5% compared to +1.6%. On a year-to-date basis, the Russell 2000 Growth Index has produced a 15.8% total return while value stocks are up only 7.1%*. It’s a tough time to be a value manager! We often get asked if we are more “value” or “growth” in our approach to investing in small- and micro-cap stocks. Our response is that we are both. We try to combine the vision of a growth manager with the discipline of a value manager. In other words, we want to invest in companies that have strong franchises, led by capable and focused managers, that can compound capital over long periods of time, but we don’t want to pay the prices normally associated with such businesses. How do we accomplish that? For most investors, spending time and effort on small- and micro-cap stocks is not an economical endeavor. In a world where the asset management business is predicated on scale, this investment universe is simply not big enough to accommodate large, sophisticated pools of capital (public or private equity). The combined market cap of the Russell Microcap Index is roughly the same as the market cap of Berkshire Hathaway today (roughly $500 billion). By limiting our focus and our capacity, we believe that our durable competitive advantage is simply having the discipline and willingness to limit ourselves to small companies that are less recognized, understood, and analyzed than larger companies. By (hopefully) being an early institutional investor to a company, we think we can occasionally find an investment that, in time, could become a better-recognized growth stock even though today it may be value-priced because it is simply unknown, misunderstood, or out-of-favor. The critical component to this investing formula is patience. While size and liquidity sometimes forces our hand on this front, it is nonetheless an indispensable part of the investment process to give companies the time they need to execute their business, compound capital, and become better recognized and understood over time. We believe that the best “catalyst” for this recognition process is simply execution and time. While the average small cap mutual fund today has turnover of 70%, the trailing twelve-month turnover for the Punch Small Cap Strategy is 21%. Our oldest holding in the strategy dates to 2005. The Punch Small Cap Strategy produced a 1.9% total return in the second quarter, lagging its benchmark by 169 basis points. On a year-to-date basis, the Punch Small Cap Strategy is up 13.2%, which is 171 basis points ahead of the Russell 2000 Index. With a portfolio of 48 names and 97.8% active share, our portfolio looks meaningfully different than the benchmark index today and we would expect performance to deviate in any given quarter. The best performing sectors in the third quarter were the newly-minted “communication services” group (which rose 12.7%) and healthcare (up 7.6%), both well above the 3.6% return of the Russell 2000. The new communications services classification in the GICS hierarchy is a mix of telecom, technology, and media companies; in our portfolio, it includes an online marketing services company, a television broadcaster, and a healthcare communications software business. It is a sort of “grab bag” of communications-related stocks that, in the S&P 500, includes the likes of Facebook, Google, and Twitter. While this group rose strongly in the third quarter, our communication stocks declined, largely driven by our online marketing company, which was downgraded by a sell-side analyst following an in-line quarterly report in August (more in the following pages). Healthcare, the second-best performing benchmark sector in the quarter, continues to be our most underweight by a long shot — 4.9% weighting compared to 15.9%. In the Russell 2000, healthcare is the second-largest group today; in the Punch Small Cap Strategy, it is the fifth smallest (out of 11). High valuations, low-quality business models, and investor euphoria in this space continue to keep us away. Energy stocks brought up the rear in the quarter (-2.8% for the index, the worst-performing group) following a strong second quarter, and we continue to be overweight this group as, in many ways, it has the opposite characteristics of healthcare: cheap, unloved, and out-of-favor. While performance for our energy stocks were mixed in the quarter, we managed to produce a positive return overall, largely on the back of an energy communications services company that nearly doubled in the quarter. 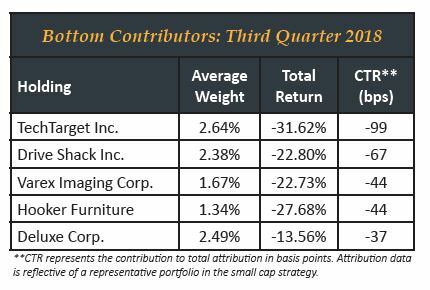 The largest detractor from performance in the quarter was online marketing company TechTarget Inc. (TTGT, $540mn market cap), a portfolio holding since 2012. TechTarget occupies a unique niche in the world of online marketing as the go-to source of information on products and trends for enterprise buyers of technology. As a B2B marketer, the company provides technical articles, whitepapers, and reviews of enterprise technology written by a network of freelance authors or technology vendors. As one of the market leaders in this space, TechTarget’s multi-decade library of consumer data is highly valuable to its customers of large and small technology vendors, which it increasingly sells on a subscription basis. TechTarget is a perfect example of a value-to-growth company for us. When we found the company in 2012, it was not growing its revenues as several large customers were in transition themselves (major customers Dell and HP were in the process of going private and splitting into separate businesses, respectively) and the stock traded at low valuation multiples. Despite this lackluster financial performance, we were attracted to its unique business model, high market share, difficult-to-replace customer data library, and new growth products, as well as heavy insider ownership and significant share repurchase and dutch tender activity (share count is down by almost one-third since 2012). Today, top-line growth has resumed, margins are expanding, and the valuation of the stock is more reasonable, in our opinion. This turnaround has not gone unnoticed, and we believe that the investor base of the company is transitioning from “value” to “growth” investors . We believe that when TechTarget announced its second quarter earnings in August, the “in-line” report was not enough to satiate momentum investors, and this relative “disappointment,” combined with a downgrade by one of the company’s five sell-side analysts, left the stock significantly below its recent high. Following the earnings report and stock decline, the company resumed its share repurchase plan and reiterated its long-term financial targets, which include strong sales growth and ebitda margin expansion. We added to the position in the third quarter. To be clear, Drive Shack is not “reinventing the wheel” when it comes to its new driving range/bar /restaurant/gaming locations which cost approximately $30 million each to build. The concept is largely copied from the highly successful “Top Golf” concept which today has 41 locations worldwide and is, by our estimation, highly popular and successful. As the “follower” in the space, we believe the bar is low for Drive Shack to execute a strategy of building out locations around the country; the company has 5 sites in development today and roughly 30 more in its pipeline. The first location opened in Orlando in April and, in its first quarter of existence, had customer traffic and revenue below our expectations. However, this is the company’s first location and there is limited data on its performance, so we are giving management the benefit of the doubt that they will be able to improve and refine the concept as they roll out more locations this year and next. In the meantime, cash on the balance sheet will continue to build as securities are liquidated and golf courses are sold, and the company is by no means over-recognized as they have only one sell-side analyst today. The third largest detractor from performance in the third quarter was Varex Imaging Corp. (VREX, $1.1bn market cap), a medical and industrial equipment company that designs, manufactures, and sells X-ray imaging components. We purchased Varex after it was spun-out of radiation oncology giant Varian Medical (VAR, $10.2 billion market cap) in 2017. Seven quarters in as a standalone company, we believe it is safe to say management is still learning how to communicate effectively with Wall Street. Varex missed consensus earnings estimates in four of the last five quarters and the lumpiness inherent in the business is not well understood. Additionally, a key part of the Varex thesis is its ability to return to historical operating margins and that has not occurred as development expenses tied with partner product commercialization ramps ahead of related revenue. Varex’s stock has also languished due to the Company being impacted by China trade tensions. As a large independent supplier of imaging components for CT machines globally, we believe that Varex is the supplier of choice for Chinese medical companies seeking to manufacture and sell in China. The associated revenue is a key part of Varex’s growth strategy. There was a negative reaction to Varex’s second quarter earnings report that China OEM partners were delaying CT machine commercialization for an estimated six-to-twelve months as they assessed their supply chains. We believe the delay is only temporary, as Varex’s technology has been part of a multi-year design process and would be hard to displace immediately prior to commercial production. Today, Varex is priced at less than 2x revenue and 13x EBITDA on an enterprise basis. This compares to its peers that tend to trade for greater than 4x revenue and 25x EBITDA which tells us expectations are low. We think that makes for an attractive risk/reward situation as Varex works through the delay in its growth opportunities and finds areas to drive profitability back to historical levels. 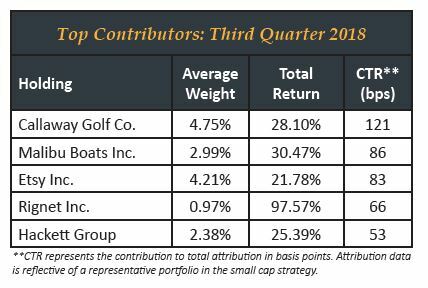 The two largest contributors to performance in the quarter were both consumer discretionary companies, Callaway Golf Co. (ELY, $2.3b market cap) and Malibu Boats Inc. (MBUU, $1.1b market cap). As we have detailed in previous commentaries, both companies are turnarounds that struggled during the last economic cycle but have benefitted from improving industry conditions, a healthier consumer, and operational improvements by new management teams. Callaway Golf reported exceptionally strong second quarter earnings in August, driven by accelerating growth in the club, ball, and apparel categories. The company now enjoys leading market share in woods, irons, and putters, and is the #2 provider of golf balls. Under CEO Chip Brewer, Callaway has refocused on innovative technology, leading to successful product launches in both 2017 and 2018, and their focus has now turned to improving its golf ball sales, which are the most profitable and most “disposable” products for golf equipment makers (we know from personal experience!). This momentum, combined with the growing value of its equity investment in Top Golf, continues to merit Callaway being a top holding in the portfolio. Malibu Boats has likewise enjoyed continued momentum in its core business as boat sales generally have continued to increase and as performance boats have outpaced industrywide growth rates this year. While we are cautious on the potential for a slowdown in consumer spending on highly discretionary boat purchases, we believe that the next chapter of the company’s story is its consolidation strategy. In the past 18 months, Malibu has executed two acquisitions of smaller, regional boat manufacturers that diversify the company’s brand portfolio, give them exposure to other types of boating, and give some scale and operational efficiency to a business that has long been a mom-and-pop industry. Through their purchase of Cobalt (luxury boats) and Pursuit (saltwater fishing), Malibu has grown without stretching its balance sheet or its operational abilities. We are optimistic about the fruits of this strategy in the years to come. RigNet Inc. (RNET, $390mn market cap) was our third largest contributor to performance in the third quarter, and the best-performing stock in the portfolio. In a quarter where small cap energy stocks were down, RigNet was a positive outlier. The basic business of RigNet is to provide telecommunication services to offshore and land drilling rigs. In contrast to much of the energy industry, the business is relatively predictable, recurring in nature, and nicely profitable (20% EBITDA margins were the norm before the energy bust of 2014-15). This niche industry is also essentially a duopoly between RigNet and its primary competitor. While it is difficult for a customer to displace RigNet’s services once equipment is installed on a rig, it is not difficult to shut off if a rig is taken out of service or “cold stacked.” That is precisely what has happened over the past five years, as offshore rig counts globally have fallen by half (source: Baker Hughes). However, with a recent pickup in crude oil prices and renewed drilling activity has come an uptick in the number of rigs globally and a glimmer of hope that RigNet may return to growth once again. In large part, we believe this realization by investors is what has led to such a dramatic share price increase recently. It is a good example of an attractive business model going through a painful cyclical downturn that may be mercifully ending. On top of this cyclical turnaround, we believe that there is more to be excited about with the company today than there was before the energy downturn. RigNet management has not stood still during this period, but instead has executed a series of tuck-under acquisitions to bolster their value proposition to customers by adding analytics and applications. As more investors sit up and take notice of the growth and operating leverage that we believe is ahead for the company, there is a strong case to be made that the company is more valuable today and has, in effect, widened its competitive moat. The Punch Small Cap Strategy ended the quarter with 48 total positions, with no new holdings added to the strategy and none exited in the quarter. While we did not “pull the trigger” on any of our watchlist names in the past three months, we did actively manage position sizes, with five separate increases to existing positions and four trims. Total strategy turnover over the past twelve months has been 21%. Our largest position as of September 30th was Callaway Golf Co., at 5.5% of the portfolio, and the top ten positions accounted for 37.2% of total market value. Over the years, we have often included citations from the most successful investor of our lifetime, Warren Buffett. We anticipate each annual letter from the Berkshire Chairman in the same way children wait for Christmas morning. While Mr. Buffett is often thought of as a value investor (somebody who likes a good deal), he modified this philosophy in a 1989 letter to shareholders when he wrote, “It is far better to buy a wonderful company at a fair price than a fair company at a wonderful price.” This one sentence seemed to mark the start of Mr. Buffett’s evolution from a “deep value” investor – who enjoyed buying dollars for 60 cents – into a growth investor. In short, Buffett seems to have strayed from Graham’s teaching. As we embark upon the fourth quarter of 2018 and reflect upon the last 10 years, we see a fairly one-sided investing world. Growth has outperformed value across almost all equity asset classes from small cap to large cap, both domestic and international. We note that, through the first three quarters of 2018, the S&P 500 Growth Index has returned nearly 17%, while the S&P 500 Value Index has languished at a less than 4% return. Over the last 10 years, growth investors have strengthened their conviction, while value investors have been left muttering to themselves. Paying 60 cents for a dollar doesn’t matter if nobody is willing to pay you more for it later. The longer history of buying value priced stocks seems more compelling. Since 1979 the Russell 2000 Value Index has produced an annualized return of 11.3% versus 9.2% for the Russell 2000 Growth Index. We agree with Marks. In 2009, some of the best performing stocks over the coming several years were those of companies that were struggling to survive. In contrast, the stocks of some higher quality companies fared more moderately over the same timeframe. Daily, a critical component of our process is identifying extreme investor sentiment. We tend to have more success searching for companies in areas where expectations are low. Currently, with the wide disparity of returns between the growth and value camps, there appears to be no shortage of both low expectation and high expectation situations. Growth investors are on a roll, and they are feeling good; value investors are humbled and wondering whether they have lost their touch. We’ve heard the phrase, “Buy humility, and sell hubris.” This is why, almost 10 years into this stock market recovery, we are still optimistic that we can deploy capital successfully. We’ve said this before: Investing is hard. Most of the errors we see investors make are behavioral mistakes that fail to acknowledge these words. Investors who internalize these words in every market environment may have a better chance of enjoying a full measure of success. Assume that it will always be difficult to make money in the markets, and then be surprised when it is easy. Not the other way around.